York Region's largest community event, the Aurora Chamber Street Festival, is held annually on the first Sunday in June. The Festival is a fun-filled family event for all ages with 500+ vendors, fantastic street performers, live music, food galore and so much more. Yonge Street is closed to traffic between Wellington Street and Murray Drive, allowing vendors and visitors full access to the street. Plan to attend rain or shine! Free parking and admission. Why Attend? The Festival is a great way to connect with community members, learn more about local organizations, support local businesses, get fresh air and exercise while enjoying the sights, sounds, smells and shopping on the street! Discover a wide variety of vendors from far and wide, showcasing amazing products and services, special festival deals, giveaways and more. 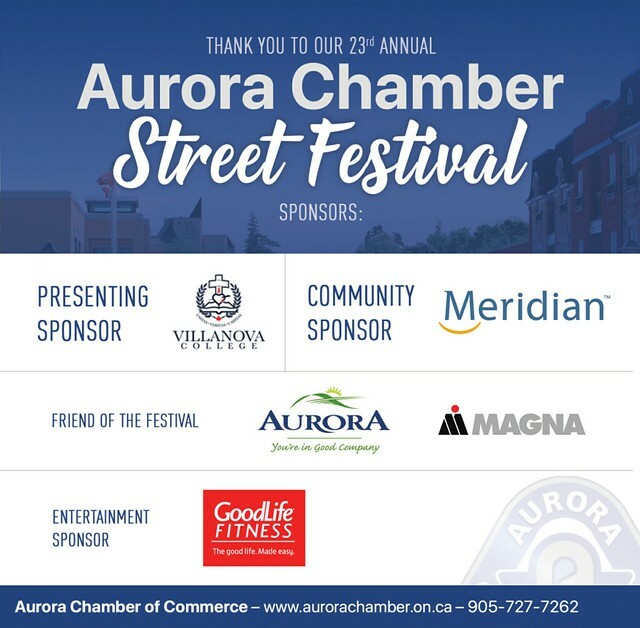 Are you intertested in participating as a vendor at the 2019 Aurora Chamber Street Festival? Please review the complete 2019 Street Festival Application, including FAQs, prior to contacting the Aurora Chamber office with inquiries. Upon submitting a complete application with payment, vendors will receive confirmation via email. Approximately two (2) weeks prior to the Festival, vendors will receive a move-in package via email, detailing their booth location and other important event information. ICE CREAM TRUCKS: Please submit your application via email starting January 14, 2019, 7:00 am. Contact Sandra Watson, Events Manager, at s.watson@aurorachamber.on.ca or 905-727-7262 x23 if you require more information. POLICY NOTE: As of 2016, the Aurora Chamber of Commerce has updated its Aurora Chamber Street Festival policy to explicitly prohibit vendors from using live animals in their booths in any capacity, excluding service dogs. Thank you to the 2018 Aurora Chamber Street Festival sponsors! We could not host this special event without the generous support of our valued sponsors. Visit our Sponsor Spotlight page to learn more about our Corporate Partners.